David Brown shares about 10 Days San Antonio. At around 4:30 you can hear him share about a life-threatening time of worship during 10 Days last year. Last Thursday, we had a call with 10 Days coordinators from many different cities. The call was incredibly encouraging for two seemingly opposite reasons: Trials and Testimonies. Many shared transparently about the trials, difficulties, illnesses, spiritual warfare and opposition from people that they are facing. When you're up against trials yourself, it's amazingly encouraging to know that you are not alone--that friends and co-laborers are also facing the same trials that you are facing. It also fills you with compassion and love for those who are paying a price to follow after Jesus. Sustained prayer and worship establishes a throne for our God and Father, and the prince of this world hates nothing more than humble, united worship and prayer, the kind of prayer that brings Heaven to Earth. This kind of prayer is dangerous--it brings opposition from the evil one because it is literally revolutionary in the spirit, upending illegal demonic dominion on the earth and establishing the Kingdom of our Lord Jesus Christ! His strategy is to get us offended with God or the Church and to get us to drop out of the race. But here's the good news--if we don't drop out of this race, we win. Our victory is secured by two things: the blood of the Lamb and the word of our testimony! God is giving incredible favor in Redding, UK to establish 10 Days in the very heart of the ruins of an Abbey that once was a gateway into England and the place that pilgrims would begin their journey. Ancient wells are being re-opened! In Connecticut, 10 different cities are entering into 10 Days. God is giving favor among both the rich cities and also among the poorer places in the state. Truly, our God shows no partiality but gives liberally to all who ask in Humility! 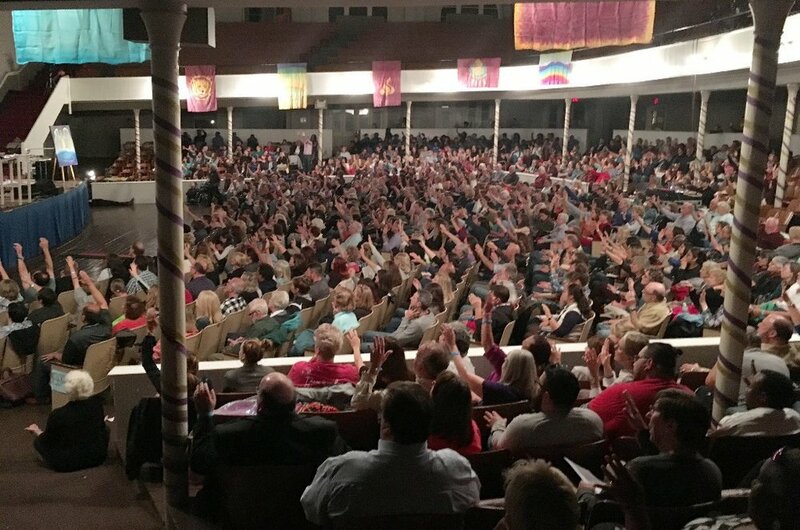 In Massachusetts, 10 Days is being hosted at another ancient well, the Northfield campus for a 3rd consecutive year. This prayer is part of God's plan to re-open this ancient well--we are seeing a previously empty campus come alive with prayer, missions, discipleship, and worship before our very eyes! So, what is God doing in your city? Every city has their own testimony, their own trajectory. With 10 Days less than three weeks away (September 9-19) we want to hear from you about what's happening in your home-town. Some 10 Days gatherings are large and some are small--it's not the size that matter, but our faithfulness to the grace God is giving us and our response to His voice and leading. So however God is moving where you live, we want to hear about it! We will link to you on 10 Days.net and hopefully you'll link from your page to 10days.net so that we're connected both ways. Every day we are overcoming, by the blood of the Lamb and the word of our testimony. God's got this--now, let's go!